Cholesterol is a naturally occurring fat that can be ingested via the foods we eat or produced by our liver. It is fundamentally required for good health – crucial to functions like hormone production, vitamin absorption, and blood vessel repair. So, how could something so necessary for good health become the enemy? When the medical establishment began to investigate the cause of fatal heart attacks, doctors found that these patients shared one similarity – their arteries had been “clogged up” with fatty deposits that were high in cholesterol. This solidified the connection between cholesterol and heart disease and doctors sought ways to lower blood cholesterol. 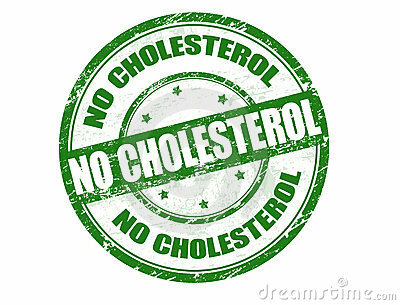 They determined the easiest way to keep cholesterol out of the blood was to keep it out of the body by restricting dietary cholesterol. What doctors did not consider however was the reason why blood cholesterol was elevated in the first place. The common cause for most cases of high cholesterol can be boiled down to one word…STRESS! Most of us can rattle off a dozen different situations that would cause us stress, but what we often don’t consider are the dozens of other ways our body’s can experience stress without us even knowing. Most of us understand that “fight or flight” is the body’s innate response to stress. In the short term our stress response increases our chance for survival in a life threatening situation and we often feel the effects of our stress response with physical symptoms. But our bodies also respond to stress in ways we don’t feel. These include increased LDL and lower HDL for hormone production, increased systemic inflammation in preparation for wound repair as well as increased heart rate and blood vessel constriction. Our stress response is designed to help us survive intense, short term stressors like being chased by a grizzly bear, or completing a particularly tough workout. When we experience mental stress – like public speaking, or forgetting your passport on an airplane will elicit the same stress response. The difference though – there is no physical outlet for the supplies of survival that have just been mobilized when we are under mental stress. But, where we really get into trouble is during all the little bouts of stress we experience through out the days, weeks, months, and years of our lives. (Check out this NatGeo video on stress) Living under chronic stress keeps the body in survival mode at all times creating a constant state of increased LDL, decreased HDL, increased inflammation, increased heart rate and elevated blood pressure. And, the worst news of all – every time you re-live that stress of the past, a new cascade of stress hormones is released in response to your memory! It isn’t a coincidence that individuals in high pressure jobs, like stock brokers, are most vulnerable to heart attacks. And one of the biggest sources of chronic, silent stress is our diet. Foods that have a dramatic effect on our blood sugar, like processed and packaged foods and foods high in refined carbohydrates, create stress in the body by raising our blood sugar. Chronically high blood sugar (diabetes) is toxic. Excess sugar creates oxidative stress when it binds to and changes the function of molecules in our bodies. And blood sugar that is in a constant state of flux because of processed foods and/or refined carbohydrates is also very stressful. But, sugar is even more insidious when it comes to your risk of coronary heart disease. Both your skin and arteries contain collagen – a springy, flexible protein that helps both bounce back after having been stretched. When a person with healthy collagen smiles or frowns, the skin bounces back and any lines or wrinkles that form smooth out. Their arteries are flexible and can stretch and bounce back every time the heart beats without damage. Sugar effects the properties of collagen and changes the way it functions in the body. When foods rapidly convert to sugar in the bloodstream they bond to the collagen in your tissues in a process called glycation. When glycation occurs, the sugar molecules attach themselves to collagen fibers. The sugar changes the chemical structure of the collagen causing it to become fragile and lose elasticity. In the skin glycation causes the skin to sag and fine lines and wrinkles to become permanent. In the arteries glycation causes the arteries to become stiff and inflexible making them more prone to damage each time the heart beats and the arteries are forced to stretch. Glycation also causes degradation of other vital organs, including your kidneys, lungs, and brain. The link between cholesterol and heart disease begins with the physiology of arteries – the large elastic vessels that carry blood away from your heart to the rest of your body. When sugar and collagen bond it produces free radicals that damage our cells and tissues. 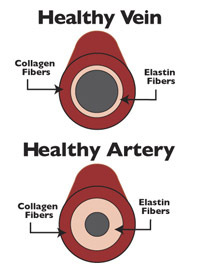 Glycated collagen also causes the arteries to become fragile, stiff and more likely to sustain damage. As a result our tissues are continual state of replacement and repair. When damage occurs to the tissues of our arteries, the new cells require an almost constant supply of new collagen to replace the damaged cells, and maintain the integrity of the artery. If blood vessels sustain damage the body uses cholesterol as a temporary fix. The cholesterol – primarily low density lipoprotein (LDL) – is used to make immediate repairs. 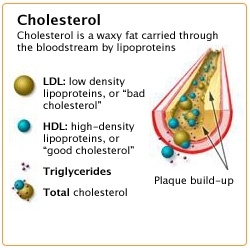 Molecules of cholesterol act like a band-aid and bind to the damaged sites preventing hemorrhage and blood loss. Damaged blood vessels also create inflammation and the immune system is up-regulated to speed repair. Platelets are sent to stop any bleeding – just like when you get a cut. A small plaque of cholesterol is laid down to keep the vessel from “springing a leak” while the walls heal. The platelets mix into the sticky LDL cholesterol plaque to form a “bandage”. But how does this cause heart disease? When new cells also contain fragile, stiff collagen the problem of damage and repair repeats itself. This is especially true in blood vessels required to do a lot of stretching like the major arteries that feed the brain – coming directly from the heart – and the vessels that supply the heart itself. Gradually the arteries become clogged with cholesterol “bandages” and restrict blood flow. 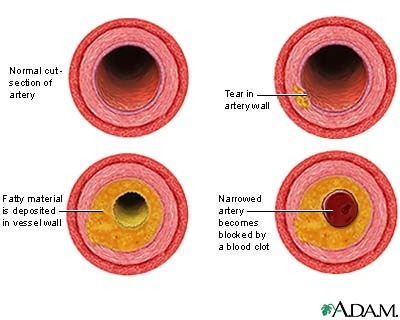 Eventually something like a blood clot or loose cholesterol plaque blocks the remaining space, causing ischemia (lack of blood flow) and infarction (cell-death due to oxygen “starvation”). So, what happens when you have a diet that includes cholesterol rich foods? Does the added cholesterol exacerbate problems already caused by sugar’s interaction with collagen? Is our fear of cholesterol in our diet warranted? Should we consume boxes of oatmeal and Cheerios as the American Heart Association has recommended to remove cholesterol from our blood and reduce our risk of heart disease? And if we have high cholesterol are statins really the answer?